On the back of our record annual growth in the UK and strong traction in new markets, we’re excited to announce that we’ve raised $22.5m from Accel, Balderton Capital, Notion Capital and Passion Capital. We will use this new round of funding to accelerate our creation of the first global bank-to-bank payments network. Our payments network solves a universal problem; how to bring together recurring payment solutions that remain fragmented across countries. In the past, most businesses using these solutions were domestic, with no need for international reach. But in our increasingly globalised world this situation is no longer viable, especially with the dramatic growth of global subscriptions and SaaS platforms. As a growing number of businesses go global, they face endless frustrations in managing payments across multiple territories. GoCardless has the perfect head start to solving one of the financial world’s most enduring challenges. We’ve engineered a way to simply plug recurring payments into existing systems across the world, so businesses can focus on the issues that really matter. Our users are already collecting payments across the UK, Eurozone and Sweden. Australia and Denmark are coming soon, with more to follow. Over the coming months and years, our mission is to enable businesses around the world to process recurring payments from anywhere, to anywhere - in any currency. This new funding round is not our only key milestone this year. We now process more than $4bn worth of transactions a year, across more than 30,000 organisations in the UK and Europe. Our existing partnerships are flourishing, with QuickBooks, Xero and Zuora along with many others, and we’ve just announced a new partnership with Sage. I’m very excited about our next steps and proud of the hard work we’ve already done to get this far. Our ongoing success is thanks to our incredibly loyal and supportive users, both in the UK and further afield. Going forward, we plan to use the knowledge we’ve gained in the UK and across Europe to solve a major challenge that affects businesses collecting payments globally. In the process, we’ll be taking another step closer to achieving our vision of building a global payments network for the internet. We're excited to announce that we’ve raised a new $13m funding round led by Notion Capital and supported by our existing investors Balderton Capital, Accel Partners, and Passion Capital. We’re particularly pleased to have Notion Capital on board as their team will bring additional expertise and experience to our board having built and exited three highly-successful businesses including MessageLabs. This is key for us to succeed in our vision to build a new payment network for the internet. It allows us to improve on our existing product in the UK and Europe, as well as expand our global footprint. The fundraise is not the only milestone GoCardless has reached over the last few months. Today, we’re also pleased to announce that we are processing more than £1 billion per year - collectively, our 16,000 merchants are collecting over 10 million payments each year through our bank-to-bank network. Our solution has opened up access to the Direct Debit system for small businesses, and has helped multinationals meet the needs of their customers with a Direct Debit solution built for the digital age. We’re proud that this has contributed towards the 5.8% annual growth in Direct Debit payments that Bacs reported last year. In addition to opening up Direct Debit to small businesses, we’re also creating new ways for customers to pay for products and services. For example, we now work with Thomas Cook to offer their customers the option to spread out their cost for their dream holiday. Our expansion into new markets is also picking up pace. We are now serving businesses in Spain, the Netherlands and Sweden. They add to our growing presence in France and Germany. In France we are growing four times faster than when we launched in the UK, driven by customers like Habitat & La Fourchette, and partnerships like Mangopay. In Germany, we are picking up traction with some great customers including rankingCoach, betahaus Hamburg and the soon to launch partnership with accounting software Debitoor. Whilst I am immensely proud of all of the above, our ongoing growth and success is all down to you, our incredibly supportive and loyal users. This is why my highlight of the year so far is the launch of our new dashboard next month. We’ve used your feedback to make it more intuitive than ever and given it the power and flexibility to grow with your business. It’s been a huge company-wide project and we hope you enjoy using it as much as we enjoyed building it. We look forward to hearing your thoughts. Want to help us build a new payments network for the internet? We're excited to announce that GoCardless is now processing over $1bn each year. It's a great milestone in our journey to create a new payment network for the Internet. Over the last year we’ve seen a 250% increase in volume as our customers increasingly recognise the potential of Direct Debit. We've welcomed large new customers, including the Guardian, Box.com, and Habitat, at the same time as continuing to serve thousands of small business. In fact, over half of our volume comes from businesses that have never had access to Direct Debit before. With over 2,000 businesses signing up to collect payment via GoCardless every month it still feels like we are at the beginning of our journey. European expansion is well under way - we just launched in France, are in open beta in Germany and Ireland, and will be launching across the rest of Europe as soon as we have the team to build and support our business internationally. We're not planning on stopping at SEPA & UK Direct Debit, either. 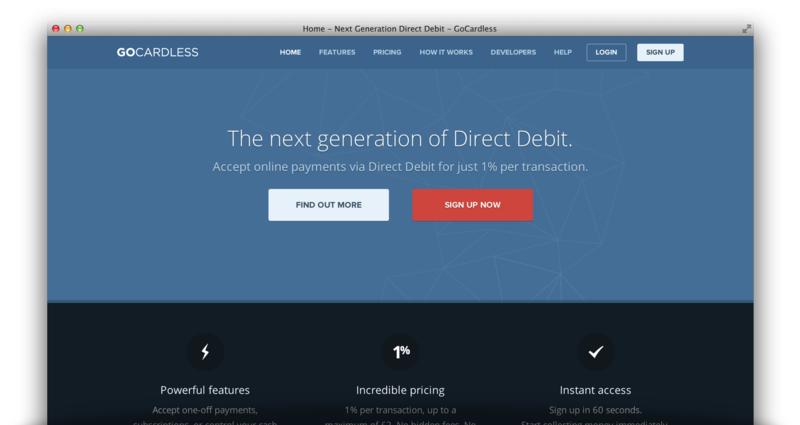 Our vision is to create an international Direct Debit network to power simple payments for the Internet. Expect more announcements soon! Want to help us hit $10bn? We're hiring! 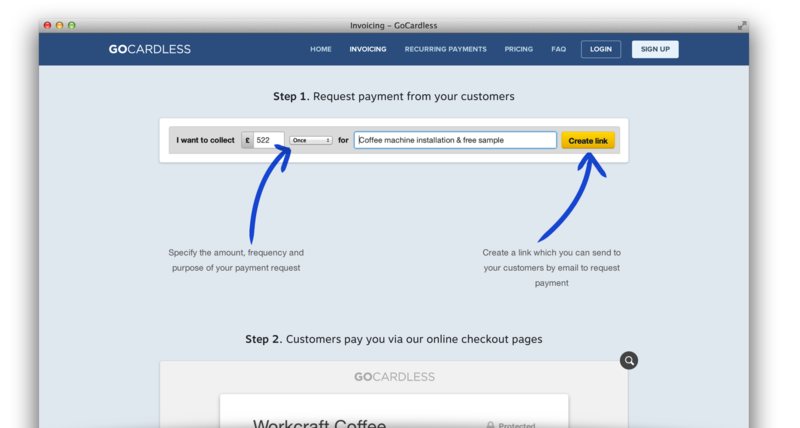 You can now cancel any upcoming/scheduled payments from within the GoCardless add-on in Sage. You can do this by opening up the GoCardless add-on, selecting ‘Unpaid Invoices’ and double-clicking the invoice you’d like to cancel upcoming payments for. Then simply select ‘Cancel all scheduled payments’ - this will cancel all ‘Scheduled’ payments for that invoice. We've just redesigned our home pages, and moved from a responsive design to an unresponsive one. Given the trend towards a responsive web, we thought we'd share why. When we designed our old home pages we followed the trend towards responsive design. The result looked great on desktops and went some way towards being device agnostic. I don't think anyone would argue that it isn't a good thing to provide a mobile friendly interface for your web applications. However, we had focused on fitting content to a flexible grid without really assessing the requirements of our site. We were pitching to the wrong audience - it turns out that not many people shop around for Direct Debit on their mobiles. When we analysed our traffic, we found that only 2% of visits were from mobile devices. It constrained our designs - we didn't have the resource to implement entirely different designs for desktop and mobile. This restricted us to simpler designs that could work for both formats. In some cases, this even led to compromised designs which weren't great for either format. For our new design, we decided to stick to a fixed grid of 980px. This gave us a canvas that comfortably rendered on almost all desktops as well as on tablets. Using a fixed grid roughly doubled the speed of the design and development process. It also gave us more flexibility to implement designs which wouldn't have worked at smaller sizes. Not only did we save a lot of time by avoiding responsive design, we were also able to provide a better experience to 98% of our visitors. When should you be responsive? The proportion of mobile use - obviously, if a significant proportion of your traffic is mobile, you should design for that audience. The purpose of the visit - will providing a better user experience for mobile users significantly impact your desired outcome? For example, we believe it is really important to have a fully responsive design for our checkout pages. Even small changes in checkout page conversion can make a big difference to our customers. Whilst only ~3% of visitors to our checkout pages are on a mobile, having an appropriate design can significantly impact their conversion. So it's worth investing in, even for a small proportion of our visitor base. Mobile visitors often have a very different set of objectives for visiting your site. In those cases, merely squashing content to fit on a smaller screen isn't particularly helpful. Instead, it is important to consider how different contexts change the content that users want. Responsive design is definitely a useful tool to consider, but it's also important to be clear on the case for it before embarking on any new projects. 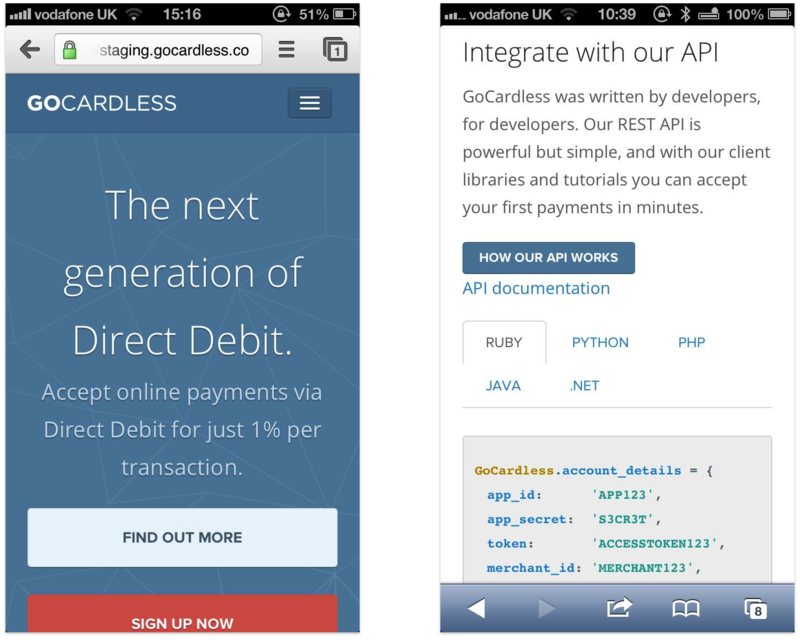 We've been working on some exciting stuff at GoCardless in response to your feedback on what features you'd like. We're pleased to announce them here. 1) Specify where users are sent after they've paid: check out the 'Redirect customers after checkout' section in 'Advanced Options' when creating a PayLink. 2) Specify start and end dates for subscription payments: For example, you could specify monthly payments starting on the 1st of the month and stopping after 6 months. Both these options are under 'Advanced Options' for any recurring PayLink you create. (If you can't see these, change the frequency from 'Once' to any of the other frequencies). We're equally excited to be able to give everyone access to PayLinks, our simple user interface for creating payment requests. However you normally use GoCardless, you'll now see a 'PayLinks' tab in the top left of your GoCardless dashboard. 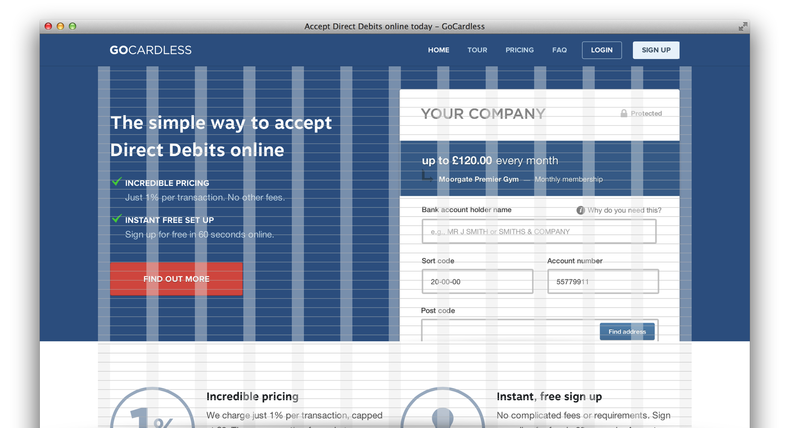 From there you can create Direct Debit requests incredibly easily. As ever, we'd love to hear your feedback and thoughts on GoCardless. Don't hesitate to get in touch with us at help@gocardless.com!